Fresh pasta filled with spinach and the best tasting cheeses available. One bite, and you’ll swear off plain, boring pasta! 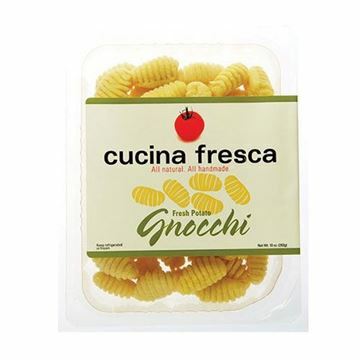 Seattle-based Cucina Fresca makes their pasta in small batches using only fresh, natural ingredients. This ravioli is made with fresh chopped spinach, a blend of ricotta, Parmesan, and Romano cheeses with a hint of nutmeg and spices, then wrapped in spinach and egg pasta. Dinner served! Add Cucina Fresca Spinach and Ricotta Ravioli to your order today. Note: Product is good for 25 days from receipt. Handmade pasta wraps filled with the best tasting cheeses available. Thick, soft potato dumplings made from scratch in Seattle. I was really excited to try this but it is very bland and flavorless. 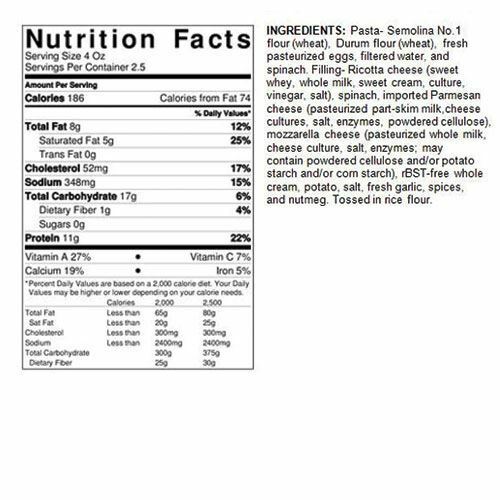 I love ricotta cheese but it did not complement this pasta. My husband thought this was okay, I didn’t like it! Love these raviolis so much! Even my baby ate them! Never been a spinach fan but I gave it a shot because my boyfriend is, and I was very pleasantly surprised! This was absolutely delicious, especially with a bit of alfredo sauce and parmesan. Will be buying again for sure! I make these about once a week. Both my husband and my 1 year old love them. I don't add any sauce, just a little salt and pepper with a tiny drizzle of olive oil and they are set!